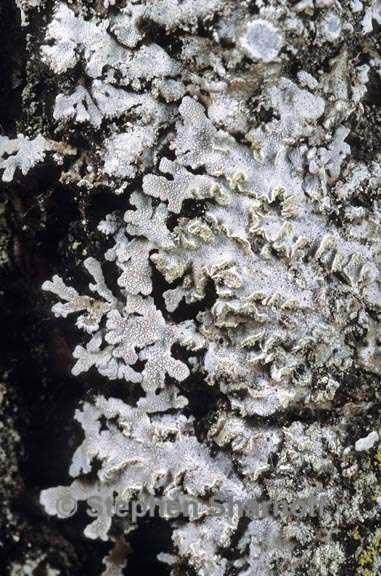 Thallus: foliose, up to 6 cm in diam., irregular to orbicular lobes: linear and discrete to somewhat irregular-rounded and partly imbricate, 0.5-2 (-3) mm broad, ± flat to irregularly concave upper surface: gray-brown to dark brown, with a partial (lobe ends) to essentially complete pruina, sorediate soredia: in primarily marginal soralia which are elongate, straight to somewhat curved, the margins weakly reflexed at times so that some marginal soralia may appear weakly labriform, laminal soralia occasionally forming in older thallus parts, the individual soredia granular, coarsely granular to sometimes pseudocorticate and isidioid, often somewhat to distinctly darkened upper cortex: paraplectenchymatous (although often not apparent until at least 1-2 mm from the lobe-tip) medulla: usually pale yellowish to yellow in large part, sometimes white to off-white in part (especially but not exclusively in younger thallus parts) lower cortex: irregularly prosoplectenchymatous lower surface: peripheral lobes usually pale tan or tan-brown, soon darkening inward to dark brown or black, dull to weakly shiny; rhizines: black and squarrosely branched Apothecia: infrequent, c. 2 mm in diam., sessile, the margin thick and entire (non-crenate) but soon becoming sorediate, at least in part ascospores: 28-35 (-38) x 15-18 (-20) µm Spot tests: cortex all negative; medulla K+ yellowish (sometimes very obscure), C-, KC+ yellow to yellow-orange, P-; soralia K+ and KC+ yellowish to yellow orange or K-, KC- (especially when soredia become brown pigmented) Secondary metabolites: secalonic acid A in the medulla and soralia (in very variable amounts). Substrate and ecology: bark, rock, mosses over rock, or on occasion soil (usually over rock) World distribution: North America, Europe, North Africa and Asia Sonoran distribution: primarily higher elevations in southern California, Arizona and Baja California. Notes: The medulla is usually pigmented (pale yellow or darker yellow), and then this sorediate species is difficult to confuse with any other. However, if the concentration of secalonic acid A is very low, resulting in the medulla appearing white, the spot tests can be very obscure also, and requires careful interpretation. Such specimens have usually been misidentified as one of the other sorediate species.